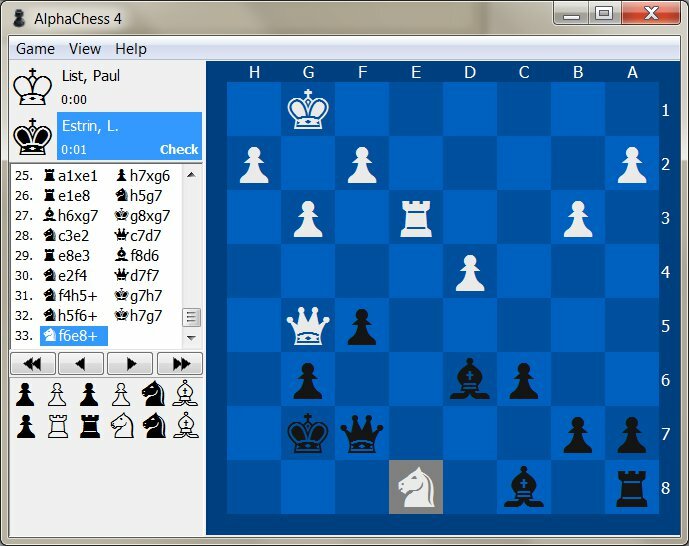 AlphaChess is a new generation of computer chess program. It offers several advanced fonctionnalities while still remaining intuitive and easy to use which makes it the perfect solution whetheryou want to have fun with friend or hone your skills by playing against the computer. Three play mode are available, play a local game on one computer by exchanging the control between you and your adversary, play an online game by connecting to the new dedicated server which allows you to join or observe any created game or play against the computer's artificial intelligence. Required operating system : Windows XP, Windows Vista, Windows 7. Fixed bug that could occur while playing online. Added server/client version validation when connecting. Fixed problem with displayed player name on resign. Fixed player name display when leaving a room. Fixed bug where a paused network game would resume without another player. Fixed bug in default themes. Fixed bug with display of players ready state. "Ready" now show before other player state in player panels. Tooltip no longer shown in player panels if both colors are taken. Connection to server now closed if online game dialog is closed and not in a room. Fixed display or game resumed / started. Fixed undo player name display. Fixed a memory leak in an online game. Added auto-refresh of online room list (every 10 sec.) in online game dialog. Fixed a bug with the sending of text message in online play. Fixed a bug with the display of player and room names in online play. Fixed a bug with the en passant move. Fixed a bug that would not allow to perform an en passant move. Changed the address of the game server. Fixed a bug that would not allow a player to promote a piece. Fixed a bug that would crash the game when playing against the computer. Fixed a bug that would make a computer player move twice after a promotion. Fixed a bug that would not load the player names correctly in the new game window. Fixed a bug that would not load the selected language file on startup. Fixed a bug inside the language file. Added the option to dock the chat window and move list to the main window. Added game Saving and Loading in either local or online game. Added pop-up menus to the host and ip address lists. Added automatic scrolling of the chat window. Added option to choose between simple, mixed and algebraic chess move notation. Changed the game interface display to be automaticly refreshed every 30ms. Changed the controls in the new game dialog window. Changed the controls in the options window. Changed the chat window text input limit from 100 to 255. Changed the format of the history export function, games will now be exported in the PGN file format. Fixed a bug that would not display the scrollbar in the chat window. Fixed a bug that would allow edition of the chat window history. Fixed a bug that would not apply options when no language file is installed. Fixed a bug that would allow do to castling even if the case next to the king was checked. Alot of other minor modifications and bug fixes. Added the display of the player name in bold in the chat window. Added the display of the last piece moved on the game board. Added option to choose last move color. Fixed a bug that did not reset the chess board correctly during online game. Fixed a bug that did not save the king's position correctly when undoing a move. Fixed a bug that did not display the correct player status when undoing a move. Fixed a bug that caused memory error when exiting the program. Added smoother look of captured pieces. Added better looking chess sets (polished existing ones). Changed the appearance of captured pieces and of the player's information. Changed the format under wich the history data is saved. Changed and optimized the chess AI codes. Changed and optimized the online game codes. Fixed a bug that displayed wrong result in history if forfeited during online game. Fixed a bug with the chess AI that caused errors when exiting game. Fixed a bug with the chess AI that would prevent him to make a move. Fixed a bug with the chess AI that would cause an error when he is checkmate. Fixed a bug with the chess AI that would cause random errors. Added move repetition prevention to the Chess AI. Removed the rule of repeating 3 moves creates a tie. Fixed a bug with sending text in the chat window. Added support for next generation language files. Changed the look of the players information section of the window. Changed the way the moves are saved when saving a game in the history. Fixed a source of network errors that occured during network game. Fixed a bug that would promote the computer's piece instead of the player's. Fixed a bug with the loading of the message received sound in the options. Fixed a bug that would not save with the correct date when saving a game from history. Added a new chess AI with 3 skill levels that allows you to play against the computer. Added the rule of repeating 3 same moves ends up in a tied game. Changed and optimized the move validation function and other core components. Changed the size of the information panel on top of the window. Added synchronisation between the client's and the host timers. Fixed a bug that would not hide the IP addresses when the game starts. Fixed a bug with the display of the captured pieces. Fixed a bug with the piece style options beeing disabled when program starts. Fixed a bug with the displaying of the games history when its empty. Added the option to play a sound when a message is received. Changed the overall look of the game, made the chess board and pieces bigger. Changed the move list to an independant window. Added moves list to the games history, you can view the moves made for each games played. Added the remove game, save to file and show moves list features to the games history. Added language pack support, the game can now easily be translated. Added the display of IP addresses when hosting a game. Added the possibility to do the En Passant moves. Added the option to play sounds on certain game events. Compiled the help files into a Windows HTML Help file. Added the option to change the color of the pieces. Added the option to display the game board in classic or enhanced mode. Added the option to have the game automaticly check for updates on startup. Changed the chess sets images to internal graphics ressources instead of external files. Fixed a bug that wouldn't display results in the games history when the game is tied. Fixed a bug that displayed the time incorrectly in the games history. Fixed a bug that would not load the game server address correctly, causing an error when trying to play online. Added an online help file. Fixed a bug that prevented the castling of the black player from working. Fixed a bug that would only save the last played game in the game history. Removed the status messages displayed in the chat window. Fixed a bug with the Online game windows, joining from game list was not working. Changed the current player indicator (arrows) pictures. Changed the position and the caption of the I am ready! button. Fixed a bug that would display the wrong coordinates (0-8 instead of A-H). Fixed a bug that would not display the result of a move after a promotion. Fixed a bug that would display "Waiting for player" even if hosting failed. Changed the pieces class, grouped the 6 classes into only 1. Fixed a bug that would prevent game from saving the color schemes in the file. Changed the way you start an online game, you can now join or host from same windows. Changed the order, caption and the shortcuts of some items in the menu. Added the Games history windows wich shows a list of all the game played. Added automatic oppening of the chat window when receiving a message. Fixed a bug that would allow a castling even if the case case between the rook and the king is in check. Fixed a bug that wouldn't remove the game from the game server when quitting. Added 2 new mouse cursor in the game. Changed the game board display engine from using components to canvas drawing. Added double buffering to the new board display engine to stop flicker. Changed the way pieces are moved, now the piece is displayed under the cursor when selected. Changed the local, host and join game dialog from panels to separate windows. Changed the way the pieces images are loaded up, now uses a bitmap instead of an image list. Changed all the fonts face and sizes in the game windows. Changed the players display pannel, move result and moved the ready button. Removed the "always on top" state of the chat window. Fixed a bug with the options windows, now schemes are only saved on exiting the game. Added an option to change the game server to use. Added a game server that will contain a list of current game on a server. Added an option to enable the display a move result, valid or invalid. Fixed a bug that occured when undoing a move while a piece was selected. Added drag and drop support to move pieces with only one click. Completely isolated and re-written the network protocol codes from scratch. Replaced alot of dialog windows by panel displayed in the main window. Added a default chess set so that the game is still playable without external files. Fixed a bug with having a piece selected when accepting an undo. Fixed a bug that the yes/no message box would not be displayed in french. Fixed a bug wich would cause data loss when asking for an undo in a network game. Fixed a bug with the undo in a local game. Traduced the game in french. Fixed a but with opening the chat window when not connected. Re-fixed a bug that allowed the king to rock while in check. Fixed a bug with displaying messages that would prevent receiving network data. Added the display of the opponent status while waiting to start the game. Added the possibility to undo moves. Changed the shortcuts in the view menu. Modified the IPAddress function, for better Win98 compatibility. Fixed a bug that allowed the king to rock while in check. Fixed an error with castling, the big one now moves the king 2 cases. Added more specific socket error messages, instead of socket errors. Added the possibility to change the port used by the game. Added version verification on creating a new connection. Fixed a bug with the color schemes loading. Fixed the game so it changes the captures pieces on chess set change. Fixed a bug with network play that one player could play while the other was doing a promotion. Reverified and cleaned the validation code on moving a piece. Cleaned some codes to try and make the game more stable. Added keyboard shortcuts in the main menu. Added an about window, and removed the panel. Added 6 new chess sets. Added multiple chess sets support. Included 14 set of chess pieces to choose from. Fixed a bug with forfeiting in a local game. Made some minor changes in loading and saving options. Fixed a bug with the chat window. Fixed a bug with displaying the history in a second game. Now saves and loads the window location and the selected scheme. Changed the game so it start when both player click on the start button. Changed the pause menu so it displays "Unpause" when paused. Cleaned up the client/server connect and disconnect to avoid conflicts. Added color schemes support in the options window. Fixed a bug with displaying the winner's name. Fixed a bug with the captured pieces not erasing on a new game. Fixed a bug with the chat not clearing on new connection. Modified the game so that the host has to press a button to start the game. Added support for TCP/IP network play. Added a chat window to comunicate with other player. Changed the interface to a menu. Changed the way player information is displayed. Fixed a problem with checkmates detection. Fixed a problem with the kings rock. Improved the checkmate and stalemate detections. Copyright ©2003-2010 Marc-André Lamothe. All rights reserved.